A former Republican aide to Del. 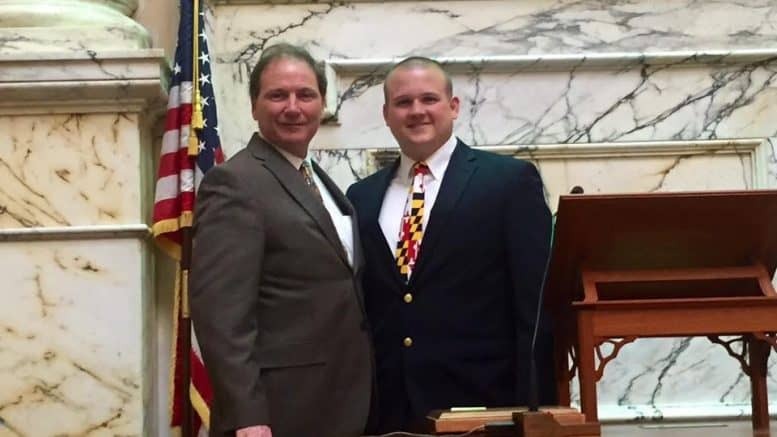 Richard K. Impallaria (R-Harford County) charged in January with orchestrating an illegal robocall against House Minority Whip Kathy Szeliga (R-Baltimore County) is set to stand trial in Baltimore County on April 30. Prosecutor Emmet Davitt charged Tyler C. Walch, 28, of Edgewood, Md. on Jan. 10 with two counts of misdemeanor campaign violations after Walch allegedly published and distributed a robocall about transgender rights last year to about 9,000 residents in legislative District 7. Walch at the time was working as a campaign aide for Impallaria. Maryland political campaigns are required by state law to identify who is responsible for all content released. Walch could face a year in jail or fines up to $1,000 for improperly concealing the party responsible for the call that targeted Impallaria’s seatmate a day before the June primary election. On March 1, Baltimore County Administrative Judge Dorothy J. Wilson granted prosecutors a postponement of Walch’s trial. Both prosecutors and Walch’s defense attorneys agreed that the matter would not be resolved before the originally scheduled March 12 trial, according to court documents obtained at the District Court of Maryland for Baltimore County. On March 4, Judge Wilson set Walch’s trial for April 30, granting prosecutors their motion for advanced postponement. Walch has retained defense attorneys Chaz Ball of Schlachman, Belsky and Weiner, P.A. and Joseph Murtha of Murtha, Psoras & Lanasa, LLC. The same court documents state that Impallaria “would not be available to testify until the end of the legislative session,” which concluded last Monday. Both the State and Walch’s defense counsel anticipate that the case will last only one day. The State also anticipates calling between four and nine witnesses, whereas Walch’s counsel intends to call between two and three witnesses. State prosecutors did not charge Impallaria in the matter, citing a lack of evidence that Impallaria was directly involved. Walch is said to have approached Salisbury University graduate Alison Porter to voice the call. Sources claim that Walch and Porter dined together at the Annapolis Cheesecake Factory, where they consumed alcohol and devised the plan to record the call. Porter subsequently narrated the dubious call as Walch recorded. Porter was employed at the time as a part-time finance assistant for Republican Craig Wolf’s attorney general campaign. Upon learning that it was Porter’s voice narrating the dubious call, she was immediately fired from the Wolf campaign. Despite being fired in January by the late Speaker Micheal E. Busch after Busch’s office learned of Walch’s charges, the former Impallaria aide was spotted in Annapolis on March 13 attending a fundraiser dinner co-hosted by Italian-American lawmakers at St John’s College. Walch, who was accompanying Impallaria at the fundraiser dinner, acknowledged that his trial was moved but refused to comment further. Be the first to comment on "Former Impallaria aide to stand trial for illegal robocall on April 30"